A relaxing getaway cabin, located on 8 scenic acres in the heart of southwestern Montana minutes from Georgetown Lake, Discovery Basin Ski Resort, and Montana's only Jack Nicklaus Signature Golf Course. Exceptional outdoor recreation abounds with spectacular views of the Anaconda-Pintler Wilderness forming the backdrop. The cabin features 2 bedrooms; one with a queen size log bed and the second with a bunk bed, double on bottom and single on the top. The living room features a cozy gas stove, panoramic windows, TV/VCR and a hide-a-bed which can sleep 2, for a maximum occupancy of 7 guests. the kitchen is stocked with dishes and all linens and towels are provided. Enjoy the views from the hot tub on the deck. Whether you want to ski, fish, hike, sightsee or just relax, Whispering Pines is a great get away cabin. Please visit our website at http://www.whisperingpinesguestcabin.com. 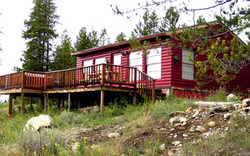 Directions: Whispering Pines Guest Cabin is located approximately 1/3 mile from Georgetown Lake, 6 miles from Discovery Basin Ski Resort, 14 miles from Anaconda and is easily accessible all year from Montana Highway 1/Pintler Scenic Route. Nearby airports include Butte (45 minutes) and Missoula (1.5 hours).